Yes, jefbot (like me) is part Japanese. If you’re wondering what else he is, click here, or what he’s been mistaken for, click here. 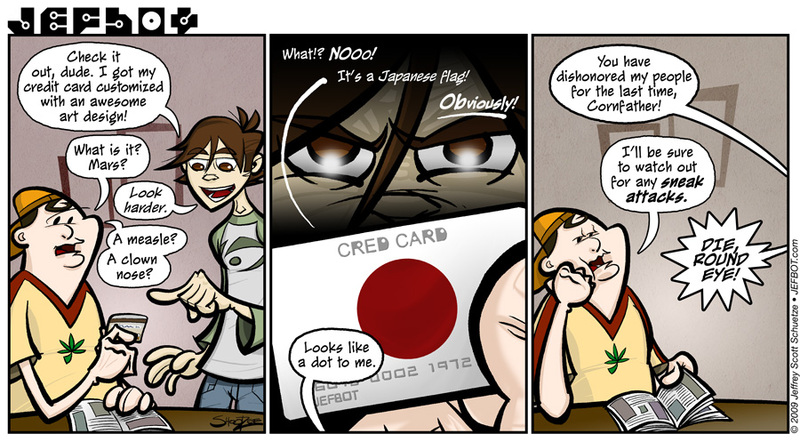 And yes, I have a credit card with a Japanese flag (Hinomaru) on it that Michael thought was the planet Mars. Granted, if I could’ve gotten a Mars credit card I probably would have, but that’s not the point. The other guy’s cannabis design shirt is nice. That’ll look great on a credit card, I believe. cannab-whatnow? i have no idea what you’re talking about, Daniel. you mean the Cornfather’s lucky leaf? Love Jefbot’s dramatical eyes in panel 2. Last panel, last sentence spoke.. I almost died laughing. (Well more like it took me about a minute to catch my breath.) Ya brought tears to these baby blues, Jefbot. Kudos! I have never been more excited to see what happens next. That menacing look, the shouting, the Cornfather’s nonchalance… all feel like ingredients for what you’re cooking up next. the cauldron’s definitely bubbling, eleventeen! i’m having fun writing and drawing this next one, so hope you enjoy it. Oh, god, I always loved to joke about the difference between ‘bonsai’ and ‘banzai’ when I found out that there was one, even though I am no where near asian. i like that, sis! kinda like mr. miyagi’s symbol but a little more subversive… heheh. HA! Don’t hold it against the rest of us round eyes. 🙂 Looking forward to JEFBOT art on Credit Cards…that would be awesome!!! i can customize your credit card right now, Jeff, with some white out and a sharpie. Hah! I have the opposite problem! I’m Mexican and Irish and got confused for being Japanese (and sometimes Korean o_O) all the time. ha! that’s AWESOME, ezri s.! good to know that kind of confusion goes both ways. heheh. One feels that vengance of Xinda-like proportions might be in the offing. maybe not of xinda-like proportions, estiveo (jefbot wouldn’t stab anyone, or spray them in the eyes with toxic chemicals! ), but vengeance is a-comin’! … … … Hold on… … …Can’t breath… … …Laughing too hard!!!!!!!! ha! i love it when my readers can’t breathe… i mean, you know, from laughing. you know what i mean! thanks, Eptha! and just as in the comic, i shall have my revenge, Cornacchia!!! being italian, maybe the Cornfather should’ve seen a meatball, reynard61! glad you dug jefbot’s outburst, alecho. I love how the Cornfather takes Jefbot in stride. I am round eye, live in Osaka!!!!!!!!!!!!! Funny joke. tell friend rater. Then rearn engrish again. What mischief will Jeffbot think of to destroy the evil round eye Cornfather? What will Cornfather do to thwart Jefbot evil design? Will East and West put on the bloodiest showdown since the age of Moses’s bloody river? Stay tune for the next episode of Jeffbot. Careful Cornfather that cc also doubles as a shuriken.